Drape on your dorm Christmas Tree, dorm desk, bookshelves, and more! Living in a college dorm room is exciting. You get to make new friends, you're more independent, and you get to decorate your college dorm room however you want to with new college supplies. When you're planning your college dorm checklist and thinking about dorm decorating, you don't have to decorate your dorm room once you move in and then be done. You can decorate your college dorm room for the holiday seasons, too! In fact, we recommend it because dorm room decorating for the holidays will make your college dorm room feel even more like home than it already does! When you're putting together your dorm necessities for your college dorm room decor for the holidays, it all starts with your dorm Christmas tree. Once you have that tough decision made, it gets even harder because you have to decide on garland and mini dorm lights! 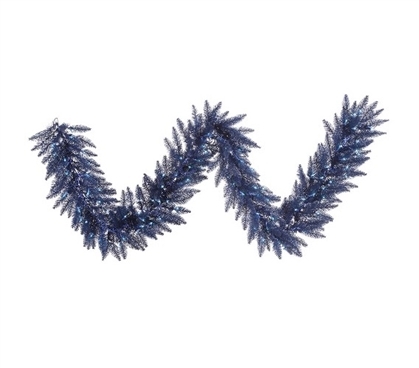 Our 9'x14" Navy Blue Garland with Mini Lights takes care of two tough decisions for you. You'll have calming blue tones in your dorm room decor with the color of the garland, and you'll also have your mini dorm lights taken care of for your holiday dorm room decorations! Our Navy Blue Garland has blue mini dorm lights on blue wire wrapped with the garland so your Christmas tree dorm room decorations are made easier and have extra flair!